Keystone Virus Makes First Known Jump From Mosquitoes To Humans A 16-year-old Florida boy is the first person known to have become infected, researchers say. Symptoms in humans include a rash and mild fever. 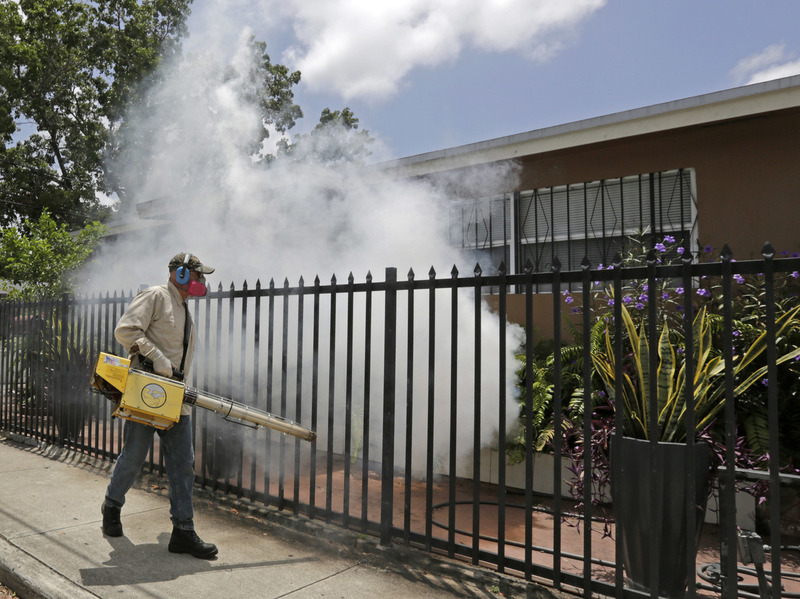 A Miami-Dade County mosquito control worker sprays around a home in August 2016 in the Wynwood area of Miami. A University of Florida study recently identified the first known human case of the mosquito-borne Keystone virus. Just in time for the hot, humid, bug-bite-riddled summer: Researchers from the University of Florida have confirmed the first known case of a human infected with the mosquito-borne Keystone virus. 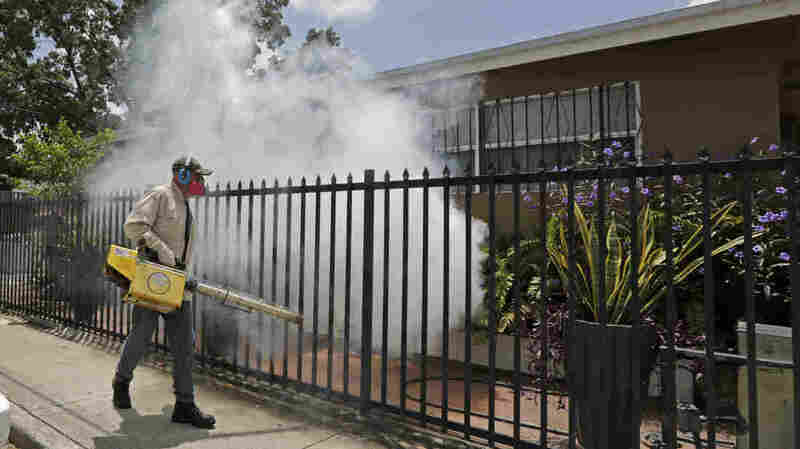 A 16-year-old boy in North Central Florida went to an urgent care clinic after coming down with a fever and a severe rash in August 2016, during the Zika outbreak in Florida and the Caribbean. Doctors couldn't figure out what made him sick. They tested for Zika and various other pathogens but hit a series of dead ends. "We couldn't identify what was going on," J. Glenn Morris, director of the university's Emerging Pathogens Institute, told NPR member station WUSF. "We screened this with all the standard approaches and it literally took a year and a half of sort of dogged laboratory work to figure out what this virus was." Researchers published their findings earlier this month in the journal Clinical Infectious Diseases. The virus was first found in the U.S. in 1964, when researchers isolated it from mosquitoes in Keystone, Fla. Since then, it "has been found in animal populations along coastal regions stretching from Texas to the Chesapeake Bay," according to a statement from University of Florida Health. But until now, there hasn't been a way to test humans for the Keystone virus, which is carried by the Aedes atlanticus mosquito, a cousin to the Zika-spreading Aedes aegypti. The virus can cause a rash and mild fever in humans. The teenager did not show signs of encephalitis, or inflammation of the brain — but Keystone is part of a group of viruses "known to cause encephalitis in several species, including humans," said lead study author John Lednicky, a University of Florida research professor in the environmental and global health department of the College of Public Health and Health Professions. Morris suspects many people might have the Keystone virus. "Although the virus has never previously been found in humans, the infection may actually be fairly common in North Florida," he said in the statement. "It's one of these instances where if you don't know to look for something, you don't find it."